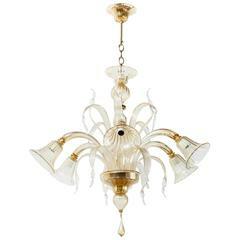 Vintage over-sized six-arm Murano chandelier. 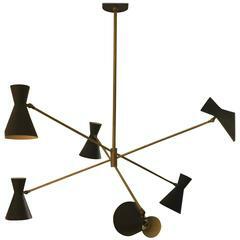 Italian Modernist six-arm brass and ebonized metal chandelier. 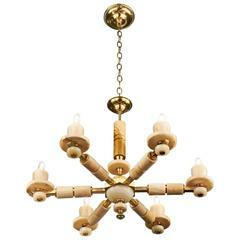 Custom six-arm brass fixture with adjustable shades in the Stilnovo style. 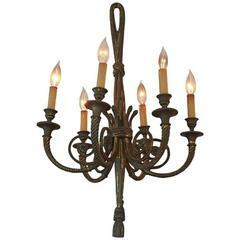 Six-light bronze chandelier with rope form arms and loops tie top terminating in a tassel. Condition consistent with age and use. The coral/pink/amber swirl glass corona with a brass rod suspending a similarly colored cone shape central glass, eminating six brass arms with glass balls and candle arms. 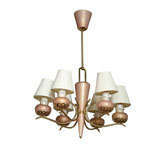 Six-light chandelier in pale amber Murano glass, circa 1960s. Sleek, clean lines with glass center shaft and bobeches and candle style lights. New wiring for US electrical standards. 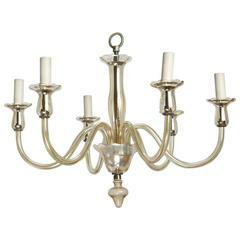 Circa 1960s six-light chandelier in pale amber Murano glass. Sleek, clean lines with glass center shaft and bobeches and candle style lights. New wiring for US electrical standards.